The April issue of DIA’s Global Forum online magazine is now available at http://globalforum-online.org. In this issue, experts take a deep dive look into several of the “trends to watch” from DIA’s “What Lies Ahead” report which was released in February. The April issue is the first in our new reader-friendly and content-rich format, featuring fresh perspectives from industry experts. Have you seen DIA’s What Lies Ahead 2015 report yet? The third annual report was released earlier this year, providing experts’ insights into the year ahead for pharmaceuticals, biotechnology and medical devices. To read the full report, click here. Who doesn’t love April in Paris? Join us as, for the first time ever, DIA’s EuroMeeting and Clinical Forum will run in parallel, from April 13-15 in Paris, France. 2015 marks 50 years since the first European pharmaceutical legislation and the founding of the European Directorate for the Quality of Medicines & Health Care. Our DIA EuroMeeting 2015 has organized special sessions honoring both the EMA and the EDQM, including our interactive Regulatory Town Hall Meeting moderated by Fernand Sauer, first Executive Director of the EMA. How do you feel about social media in clinical research? Come Join the Debate: This House believes that people are unwilling to make their data available anonymously to aid the battle against serious diseases while carelessly sharing personal data through social media will be the subject of the Oxford-style plenary debate that will open our 8th Annual Clinical Forum: Clinical Development Riding the iWave, presented in parallel with our 27th Annual EuroMeeting: Development, Innovation, Access and Patient Safety, April 13-15 in Paris. The FDA is not a monolithic entity. The agency is comprised of over 11,000 dedicated public servants whose areas of expertise and responsibilities range from pharmaceuticals to food, veterinary products, cosmetics, medical technology, dietary supplements, and beyond. InSites is a recurring commentary dedicated to clinical trial sites – including hospitals and academic medical centers – and their interaction with industry. Like Johnny Cash said, “I’ve been everywhere” — or at least it seems that way. Over the past few months I’ve visited with government health officials in China, the Philippines, Malaysia, Egypt, Algeria, Saudi Arabia, Jordan, the United Arab Emirates, Russia, Brazil, Columbia, South Africa, Kenya, and many other points in-between. And the only thing that’s grown more than my frequent flyer miles is my respect and admiration for those over-worked and under-appreciated civil servants toiling on the front lines of medicines regulation. TIRS Editor-in-Chief Stephen Spielberg recently recorded a podcast with Joseph DiMasi and Kenneth Getz, both from the Tufts Center for the Study of Drug Development. 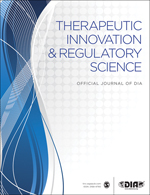 The conversation focused on their paper, published in TIRS, entitle “The Impact of Collaborative and Risk-Sharing Innovation Approaches on Clinical and Regulatory Cycle Times.” To download and listen to this free podcast, click here.